Bring the kids and make memories to last a lifetime at our family friendly homes by the sea. Beautifully furnished and decorated Victorian cottage with stunning sea views from every floor - 3 bedrooms - sleeps 6. Front decked terrace with sea views. Full central heating and free wi-fi. Dogs welcome! 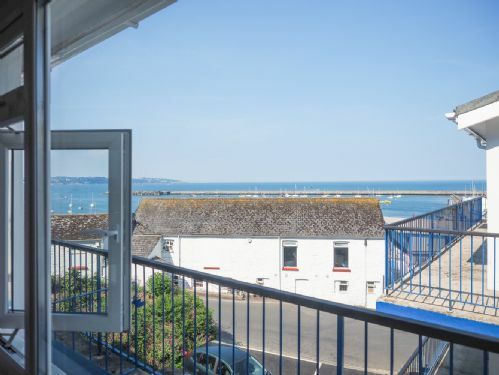 Osprey 2 is a luxury, top floor, front row holiday apartment at Fishcombe Cove in Brixham; a lovely development situated just above Fishcombe Cove. Enjoy panoramic sea views from the lounge and master bedroom, both of which have access to a very large decked balcony area. A double and twin bedroom, modern bathroom and a kitchen with all the mod cons complete this amazing apartment. An artfully decorated and accessorised 2 bedroom cottage in an elevated central location with lovely sea views and sunny patio. This truly charming property also features a real fireplace and free wi-fi. 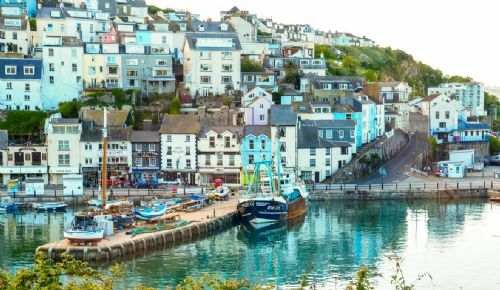 A 2 bedroom self-catering holiday apartment in Brixham with dozens of luxury touches in a peaceful new development just a short walk from Brixham Harbour. 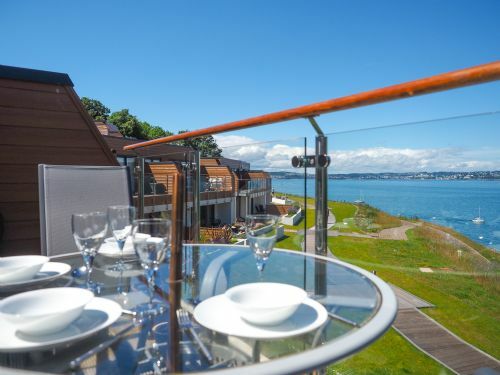 It boasts spectacular sea views from the large terrace, an on-site open air swimming pool and private access to the beach at Fishcombe Cove below. Dedicated parking 5 metres away. 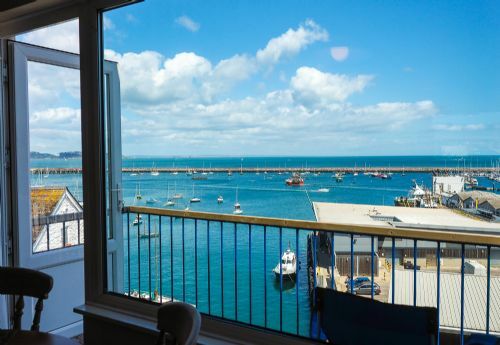 10 Dolphin Court is a smart spacious 2 bed apartment with 2 dedicated parking spaces and views over Brixham Yacht Club to the bay beyond. Central location - 2 minutes to Harbour. Free wi-fi. 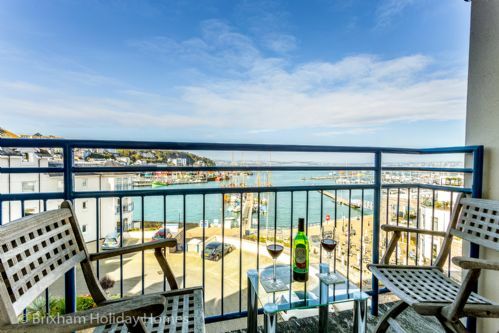 Super luxury, modern ground floor, 2 bed, 2 bath apartment with fantastic sea & harbour views over Brixham. Central location on King Street. Free parking & Wi-Fi. 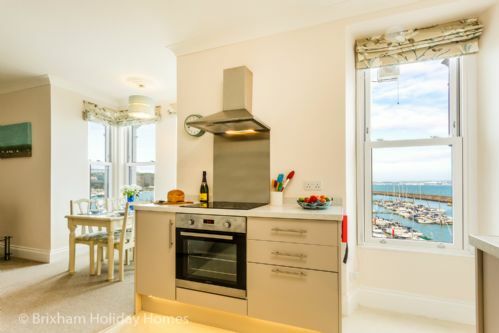 Charming 3 double bed, 3 bathroom apartment, with harbour & sea views. Modern decor. Good value. Just a 2 minute walk to the harbour. Free Wi-Fi. A super deluxe bright modern apartment where no expense has been spared. Spacious lounge, kitchen, diner with sea views to three aspects of the apartment. 2 king size en-suite bedrooms. Dedicated parking space on the harbourside. Free wi-fi. Very large & spacious 3 bed, 3 bath cottage. Sleeps 8. Ideal for large families or groups of friends. Centrally located, on the harbour side with superb harbour views from every floor. Rear courtyard. Free parking for 2 cars, free Wi-Fi. Dogs welcome by arrangement. 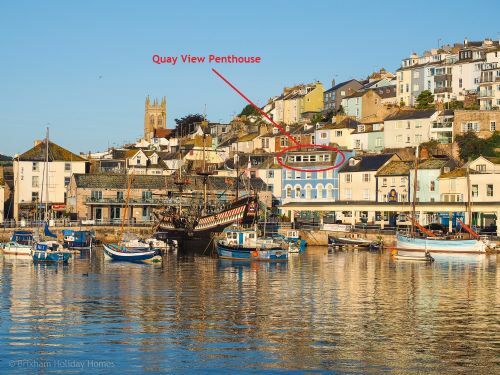 A new build 1st floor apartment in a prime location right on the corner of the harbour and Fore Street in Brixham. 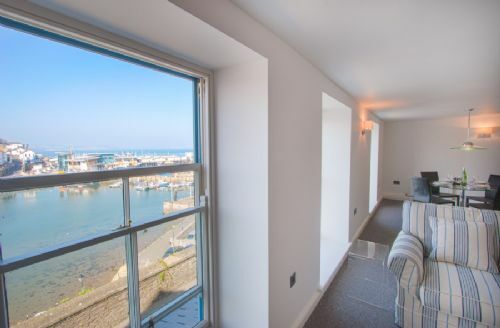 Stunning harbour views from both bedrooms and lounge. Dedicated harbourside parking included - a rarity in Brixham. Sleeps 4 in 2 bedrooms. Stunning new architect designed marine house with magnificent sea views from all rooms and a large terrace. Tastefully decorated and furnished 2 bedroom cottage with commanding sea views from the lounge and rear terraced garden. Refurbished 2018 - be one of the first to stay here! Full gas central heating and wood burning stove. Free wi-fi. Dogs welcome. A very large family holiday home that sleeps 8. 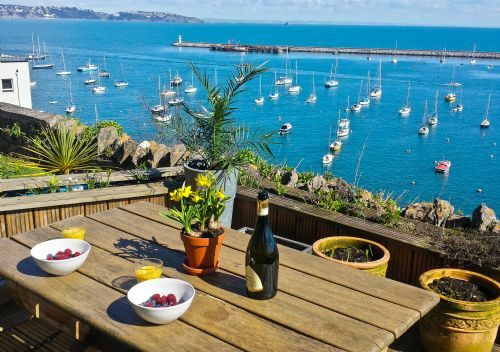 Two families can spread out and relax in this 3 bedroom, 3 bathroom marine house with a truly spectacular view over Brixham Marina and Torbay. A large outside decked area, wood burning stove and superb kitchen complete the picture. 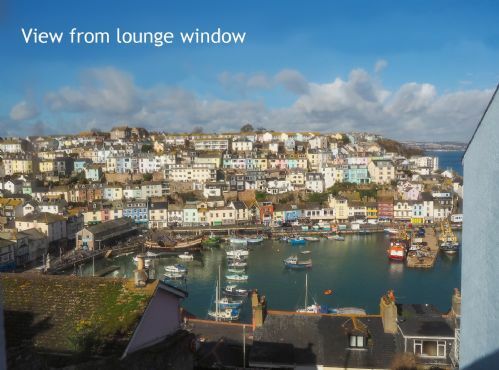 1 Osprey is a front row, architect designed, 2 bedroom self-catering holiday apartment in Brixham. It has a large terrace and dozens of luxury touches in this peaceful new development just a short walk from Brixham Harbour. Spectacular sea views from lounge, master bedroom and terrace, on-site open air swimming pool and private access to the beach at Fishcombe Cove below. 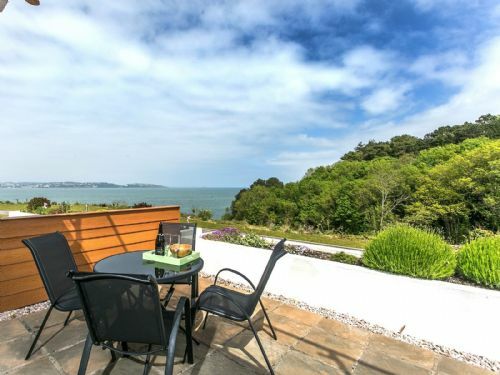 Romantically furnished & accessorised with dozens of deft touches, this large 2 bedroom, 2 bathroom self-catering holiday cottage with sea views and a wood burning stove makes a great hideaway for a couple or two. Also a great family base for exploring the area. Newly refurbished in 2017. Super luxury 3 bed, 2 bath top floor self-catering holiday apartment that sleeps 5. It is situated in a prime location with outstanding sea views, a balcony with French windows, lift, secure parking + garage & Wi-Fi. Spectacular 2 King size bedroom, 2 bathroom apartment. 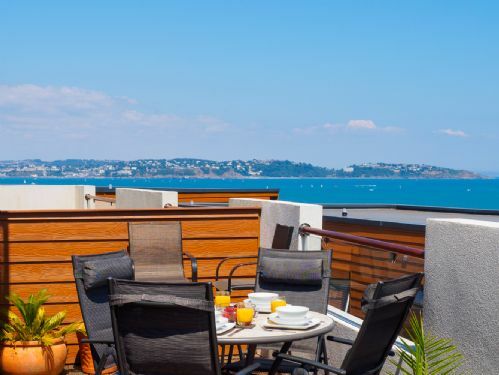 Enjoy panoramic harbour & sea views from the luxurious lounge/dinner. Full width sliding patio doors lead to a large decked balcony. 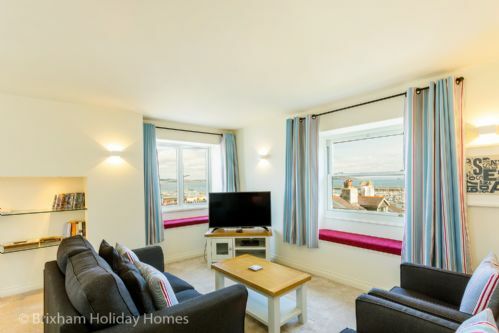 A bright, modern, 2 bedroom, top floor self-catering holiday apartment with stunning marina & sea views from lounge and master bedroom. Rear Balcony. Dedicated on-site parking and wi-fi included. 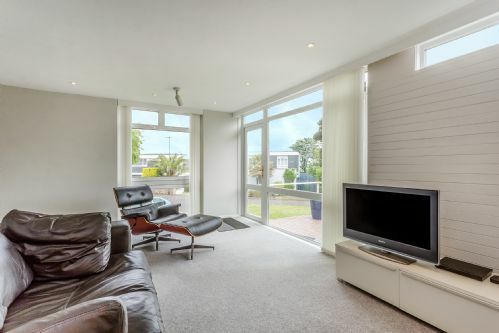 Spread out, kick off your shoes and relax in this large coastal home with outstanding harbour & sea views. On-site parking for 2 cars. 4 bedrooms, 3 bathrooms. Perfect for a family gathering or group of friends. 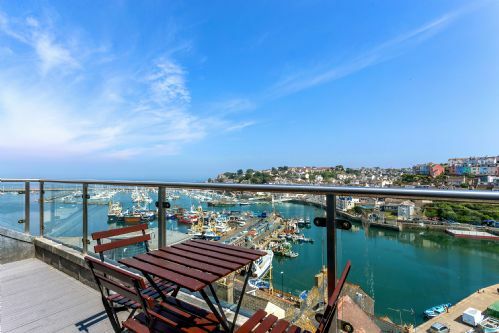 A luxury 2 bedroom self-catering holiday apartment in a new, quiet & relaxed development in Brixham, Devon. It benefits from sea views, a large outside terrace and an on-site shared swimming pool. Situated on the ground floor and with parking right outside the front door, this apartment ensures easy access for guests with impaired mobility. 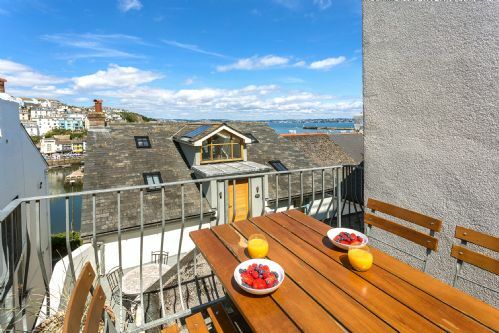 A modern, luxury 2 bedroom ground floor self-catering holiday apartment in Brixham with a large terrace from which to enjoy the costal views. Set on the front row of this quiet and peaceful new development in National Trust woodland, it features private access to Fishcombe Cove below and a shared onsite open air swimming pool, dedicated free parking & wi-fi. 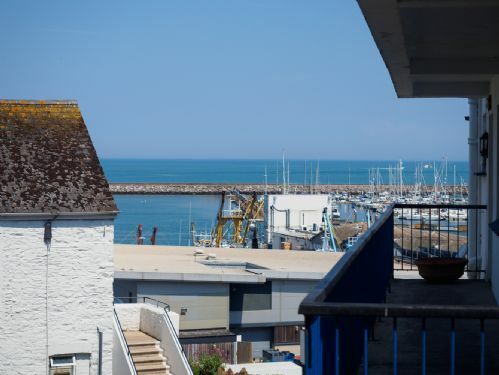 Plover 2 is a 2 bedroom top floor self-catering holiday apartment with a large balcony and dozens of luxury touches. Is is set in The Cove, a peaceful new development just a short walk from Brixham Harbour. There are spectacular sea views from the lounge, master bedroom and balcony. Plover 2 also benefits from an on-site, open air swimming pool and private access to the beach at Fishcombe Cove situated below the development. Dedicated parking 10 metres away. 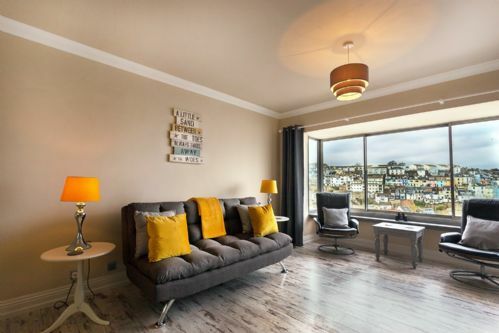 This newly refurbished 2 bedroom holiday home spans the entire 1st floor of the luxuriously fitted &#39;Stepaside&#39; development of 3 new apartments on Berry Head Road. 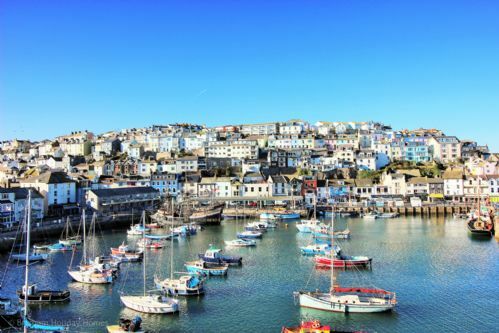 It benefits from stunning views across Brixham Marina and out to Torbay. A large open plan lounge kitchen diner, luxury furnishings and free parking in the nearby marina car park and free wi-fi make this beautiful apartment a true gem. Spacious three storey Victorian family home with five en-suite bedrooms - sleeps 9 plus infant. Perfect space for large family or friends to get together. 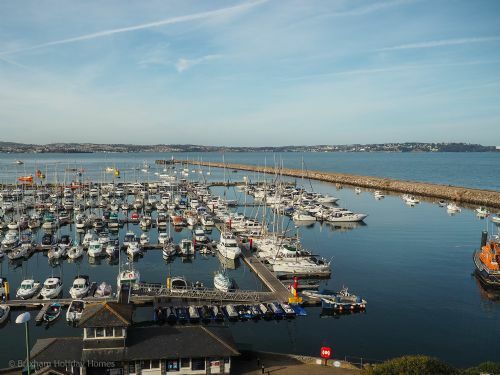 Situated opposite Brixham Marina and Breakwater with spectacular views across the marina and Torbay. 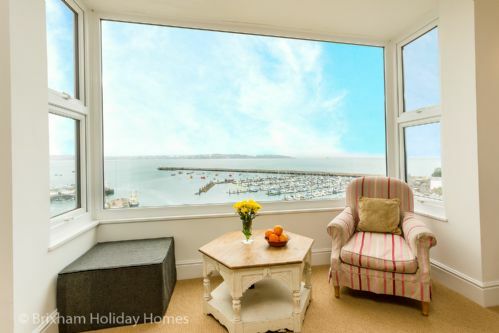 Steps away from Breakwater beach and a gentle 10 minute stroll into Brixham centre. Flat screen TVs in every bedroom. Free parking for two cars, free wifi. 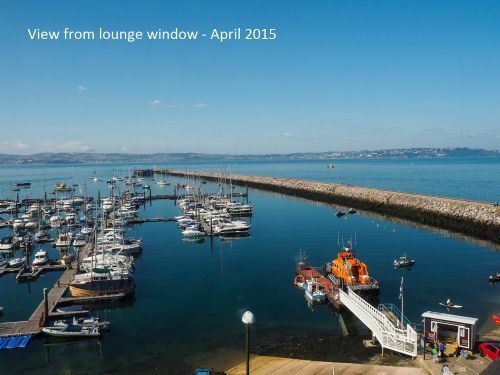 Luxurious open plan penthouse apartment with a large full width balcony overlooking Brixham harbour. 2 bedrooms, 2 bathrooms, sleeps 4 + infant. Dog friendly. Dedicated parking space. 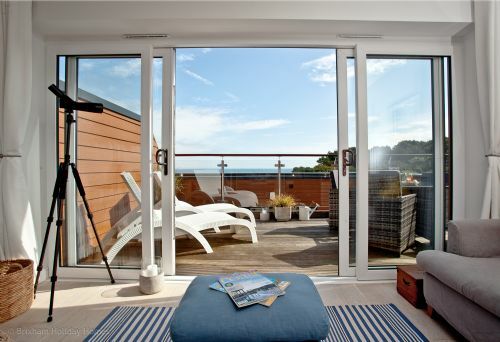 Lapwing 1 - The Cove Brixham is an ultra modern 2 bedroom family self-catering holiday apartment with a large full width patio from which to enjoy the breathtaking sea views over Fishcombe Cove and out to Torbay. Set in National Trust woodland, the Cove development includes an open air swimming pool, landscaped gardens, direct private access to Fishcombe Cove and a shared BBQ area. 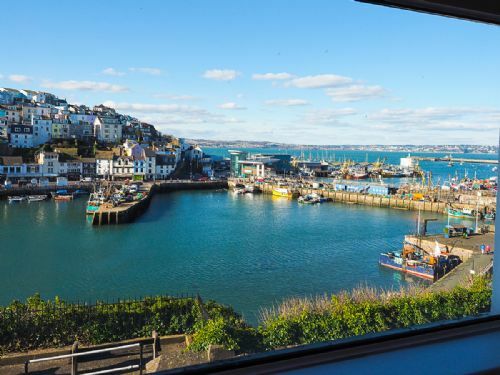 Enjoy stunning views over Brixham harbour & out to sea from this 2 bed 2 bath, ultra modern, apartment in a central location. Luxury furnishings and fittings throughout. Lovely walled patio area. Free Parking & Wi-Fi. 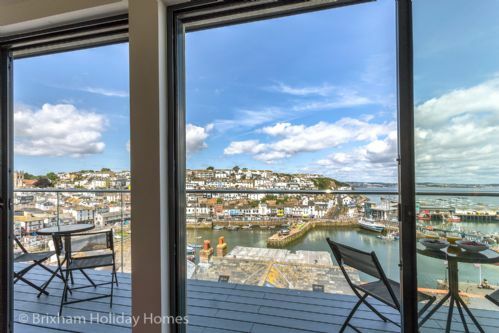 A new build modern top floor apartment in prime location with spectacular views over Brixham Harbour from the lounge and all 3 bedrooms. Dedicated parking on the harbourside & free wi-fi. Spacious & sleek minimalist style interior design. 2 bedrooms 2 bathrooms, large front patio. Onsite parking and sea glimpses from dual aspect lounge and master en-suite bedroom. Beautifully restored in 2017 four story property dating back to 1760. Integral garage, 3 large en-suite bedrooms, open plan lounge diner kitchen. 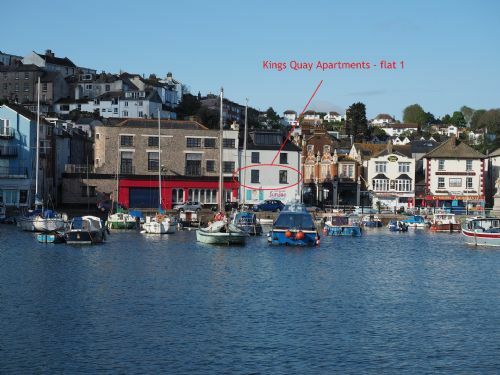 Centrally located overlooking harbour and Torbay on King Street and has a rear terraced courtyard with BBQ and sea views. 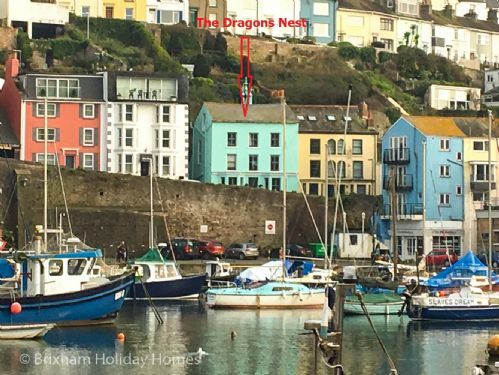 A unique triangular shaped 2 bed, 1 bath self-catering holiday cottage in Brixham with garden & balcony. Panoramic sea views from most rooms. 5 mins to harbour. Free Wi-Fi. Step into a world of magic and fantasy where baby dragons nest in the chimney, a log crackles in the hearth of a wood panelled kitchen and a secret garden waits to be discovered. 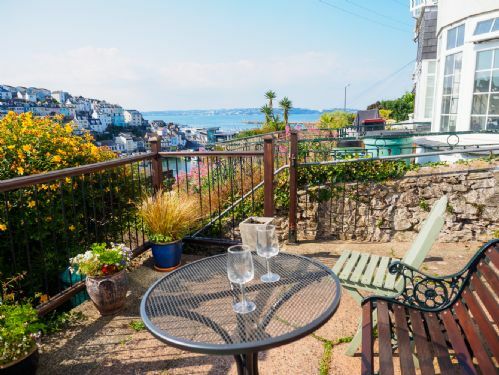 Artfully furnished and decorated 3 bedroom, 3 bathroom house with harbour views from lounge, kitchen, 2 bedrooms & master bathroom, terraced garden, log fire, wi-fi. Dedicated parking. Dogs welcome.